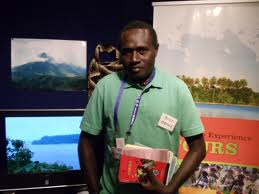 There are several indigenous languages in Bougainville Province. These include both Austronesian and Papuan (or Non-Austronesian) languages. Papua New Guinea has 860 languages belonging to two main language groups. One-third of the languages are related, belonging to the Austronesian language family group. The other languages, many of which are unrelated, belong to the Non-Austronesian language family group. Very small speech communities have languages spoken by about 15 percent of the country’s population. There are three major languages of wider communication: Tok Pisin, Hiri Motu and English. Tok Pisin is spoken more in the northern half of the country and, increasingly, in the southern half around Port Moresby. The Papuan side of the country speaks Hiri Motu. These two languages are used in the social domain, while English is used in schools and the official communication domain. The most widely spoken Austronesian language is Halia and its dialects, spoken in the island of Buka and the Selau peninsula of Northern Bougainville. Other Austronesian languages include Nehan, Petats, Solos, Saposa/Taiof, Hahon and Tinputz, all spoken in the northern quarter of Bougainville, Buka and surrounding islands. These languages are closely related. Banoni and Torau are Austronesian languages not closely related to the former, which are spoken in the coastal areas of central and south Bougainville. In the nearby atolls of Mortlock Islands, is a Polynesian language. The Papuan languages are confined to the main island of Bougainville. These include Rotokas, a language with a very small inventory of phonemes, Eivo, Telei (Buin), Keriaka, Nasioi (Kieta), Nagovisi, Korokoro Motuna (Siwai), Baitsi (sometimes considered a dialect of Korokoro Motuna) Uisai (sometimes considered a dialect of Telei) and several others. They constitute the North Bougainville and South Bougainville language families. None of the languages are spoken by more than 20% of the population, and the larger languages such as Nasioi, Korokoro Motuna, Telei, and Halia are split into dialects that are not always mutually understandable. For general communication most Bougainvilleans use Tok Pisin as a lingua franca, and at least in the coastal areas Tok Pisin is often learned by children in a bilingual environment. English and Tok Pisin are the languages of official business and government.